SEVASTOPOL, Ukraine -- Russian Prime Minister Vladimir Putin arrived to the bike show in the Ukrainian port of Sevastopol, riding three-wheeled Harley Davidson "tricked out piece of iron". Russian Prime Minister Vladimir Putin rides a Harley Davidson. The bikers, gathered at the 14th International annual bike show, welcomed premier who headed the line of bikers. He was riding posh Harley Davidson trike decorated with Russian and Ukrainian flags. "Bike is the most democratic transport vehicle. Bike is the most daring, challenging as it gives its owner the tempting feeling of freedom, that is why one can say without any exaggeration, bike is a symbol of freedom," Putin said. The image of the premier was totally matching the biker's one. He was wearing black jeans, black shirt, sunglasses and biker gloves. "There are such tricked out vehicles, such tricked out pieces of iron, like the one that I ride today," Putin said. The premier talked to bikers and put his autographs on several bikes. "You came here, because you are free people, and you can go wherever you want," Putin said, adding it was deeply symbolic that people from all over the Europe gathered at the bike show. 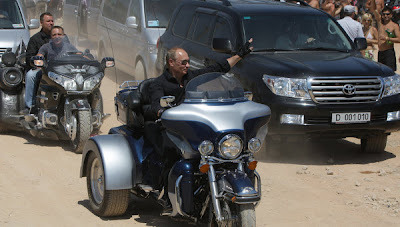 Finally, before leaving the show Putin urged the bikers not to chase the wind. "Say no to the mad ride," he said.